The Nestle Glytrol Unflavored UltraPak SpikeRight 1500ml Bag, Model #9871632391, is anchored in advanced science and research. Nestle Healthcare Nutrition offers nutritional solutions for people with specific dietary needs related to illness, disease states or the special challenges of different life stages. The Nestle Glytrol Unflavored UltraPak SpikeRight 1500 ml Bag is a nutritionally complete tube feeding formula for people with diabetes or hyperglycemia. 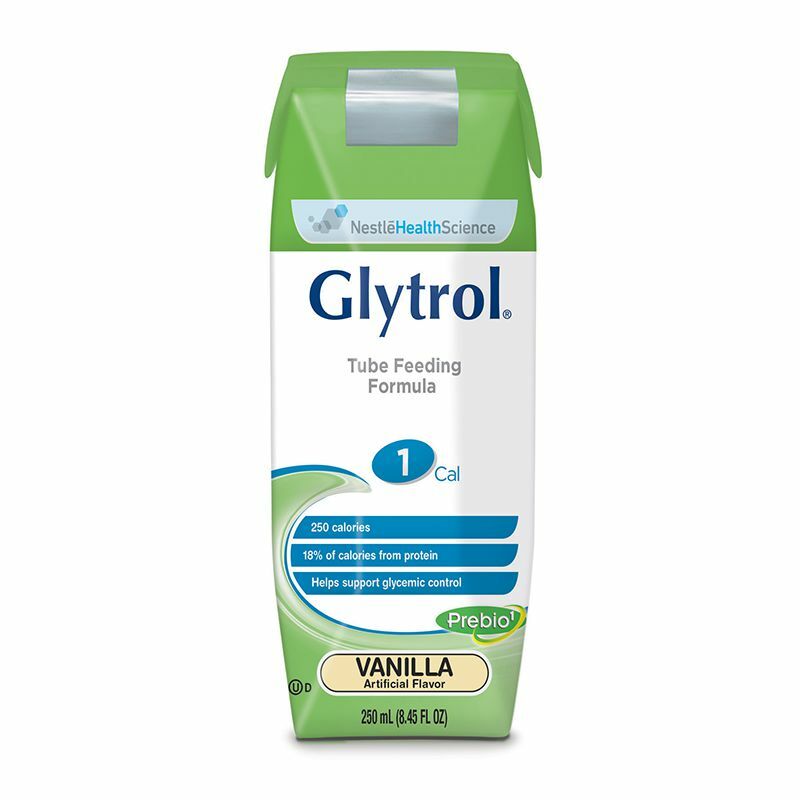 Glytrol includes a slow digesting carbohydrate blend designed to help manage gluclose levels and provide 21 key vitamins and minerals (in 1500 mL). Contains Prebio1, a prebiotic fiber blend to support digestive health. Balanced formulation to help support glycemic control. Elevated protein to support lean body mass. Fiber blend includes Prebio1 soluble fiber to help promote the growth of beneficial bacteria and insoluble fiber to help support normal bowel function. Includes 10 g soluble and 5.2 g insoluble fiber/L. Closed system with SpikeRight PLUS port for the first available proximal-end enteral connector system designed to be incompatible for IV equipment. Ingredients: Water, Maltodextrin, Calcium-Potassium Caseinate (from Milk), Modified Cornstarch and less than 2% of Canola Oil, High Oleic Safflower Oil, Medium Chain Triglycerides (from Coconut and/or Palm Kernel Oil), Pea Fiber (Insoluble Fiber), Gum Acacia, Fructooligosaccharides (Soluble Fiber), Soy Lecithin, Potassium Phosphate, Inulin (Soluble Fiber from Chicory), Salt, Inositol, Calcium Citrate, Sodium Citrate, Magnesium Chloride, Potassium Citrate, Distilled Monoglycerides, Choline Chloride, Acesulfame Potassium (Sweetener), Sodium Ascorbate, Citric Acid, Magnesium Oxide, Taurine, L-Carnitine, Artificial Flavor, Alpha-Tocopheryl Acetate, Ferrous Sulfate, Zinc Sulfate, Niacinamide, Sucralose (Sweetener), Calcium Pantothenate, Vitamin A Palmitate, Manganese Sulfate, Pyridoxine Hydrochloride, Copper Sulfate, Vitamin D3, Riboflavin, Thiamine Mononitrate, Beta Carotene, Folic Acid, Chromium Chloride, Sodium Molybdate, Biotin, Potassium Iodide, Sodium Selenate, Phytonadione, Vitamin B12.